Your suite is tastefully decorated in rustic elegance featuring locally crafted elements. 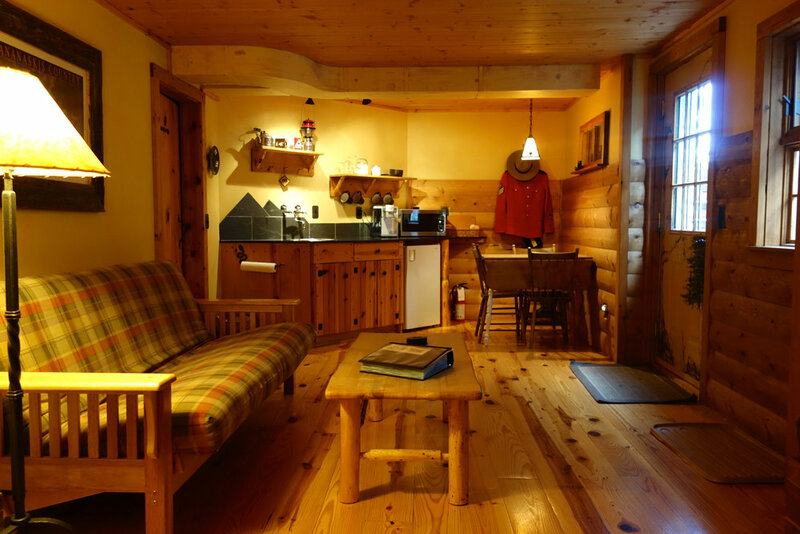 It hosts a comfy queen size handmade log bed, a sitting area with a fold out futon couch (ideal for families), a gas fireplace, and a snack centre complete with a fridge, microwave, Keurig coffee maker, toaster, kettle, dishes, complimentary beverages and a quaint table for two. For your enjoyment we have a collection of books and guides of local interest and a selection of card and board games. Relax in front of the fire while you savour the memories of a well spent day or anticipate tomorrow's adventures. There are no distractions from the television or telephone as we boast a "relax, retreat and reflect" philosophy. Soak up the panoramic scenery from our large sunny deck surrounded by the majestic Rocky Mountains. You are welcome to barbecue your own Canadian style lunch or dinner. Enjoy the stars while you gather around the "campfire" - the perfect end to a summer's day.